The Blog Formerly Known As The Blue Cottage: From Coffee Table To Cafe Ole Table! From Coffee Table To Cafe Ole Table! Whew! I have finally completed a project I have been working on a little bit each night. We were in need of a coffee table in our living space -- and I really like to rummage around finding something unique. 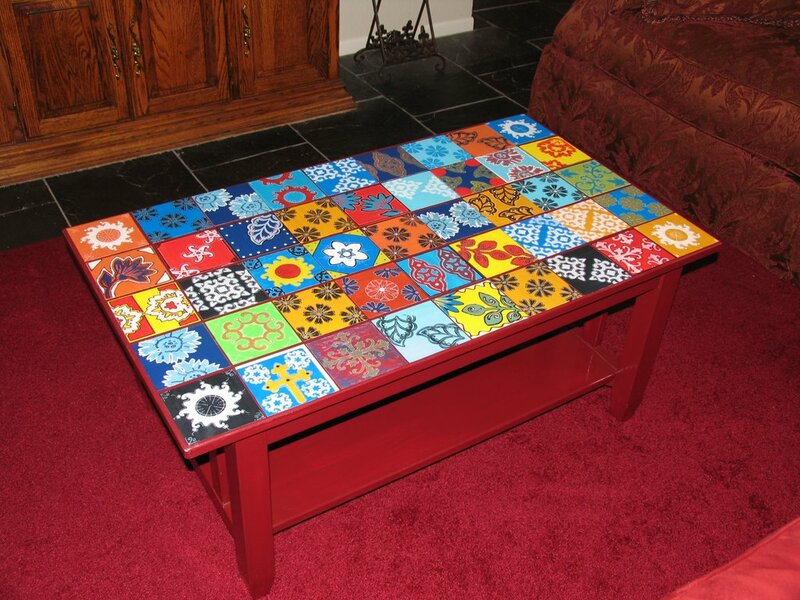 Nothing I saw appealed to me -- and then I got my mind set on having a tile table to bring color to our Spanish Eclectic decor. Of course I was not willing to part with the dinero a tile table would set me back! Sooooo...I decided to make Faux Mexican Tiles...uh... out of paper! Yes. Each of these tiles are painted on watercolor paper :) There are 45 of 'em! And of course it is varnished..so go ahead, set down that glass of Sangria..er...cup of coffee...and enjoy! Wow NICE... I love it. How many different designs did you use? I love that the corner "tiles" are the same but different. Yo tengo mucho admiracion para ti mi amiga! La mesa esta muy bomita!! Wow! Very clever! You did a terrific job! Bravo Jolene, it looks beautiful! This is a table that would leave me crying when I walked out of the store without it because I couldn't afford to take it home with me! BrotherGene! : Thanks! I really don't know how many different designs I have - that would require NUMBERS running through my head...argh...I am an artist, numbers don't work with me :-) I just put a flamenco CD on and let the muse take me away and created! Elena: Which by the way will be my new forever name for you...Gracias, Gracias, MUCHO Gracias! Angela: Welcome! And thank you! I love the play on words for your blog title! Hope you visit here often! Anony: I think I recognize you... si ? What a genius idea and beautiful and useful one, too. I was so excited to read your comment on my blog!!! I hope you visit often. What a great idea!! -- Seems like I always have sheets of paper I never know what the %}%+ to use for/with -- This is jus' the coolest way to use 'em! !